It has been 227 days (7 months and 13 days) since I brewed my Gnarly Roots Barley Wine. This beer – a creation from the mind of brewing legend Charlie Papazian – is an American-style barleywine with a twist. On the surface the recipe is a classic US-style barley wine – 100IBU of bitterness, a SG of 1.100, and fermented with a clean US-style ale yeast (Wyeast 1056). The twist is that it is secondaried with Brettanomyces lambicus and Brettanomyces bruxellensis. The additions of these “wild” yeasts should create an earthly and fruity flavour profile that mimics that which was common in pre-20th century English strong ales. I kegged the beer today, with the intent of transferring it to bottles in 3 weeks. Once bottled this beer will be cellared and brought out for special occasions – if done judiciously, I should be enjoying this beer for years to come. It turns out I had ~ 200ml of beer that wouldn’t fit into the keg, so I put it into a mason jar and stored it in the fridge for a few hours until I had the time to do a proper tasting. The beer is still a little young for tasting, but I’m not one to give up a chance to sneak a peak. Full review is below the fold. Being fresh from the fermenter the beer is flat, but even so a persistent ring of bubbles formed around the glass and hydrometer, raising my hopes that this beer will have a strong head. 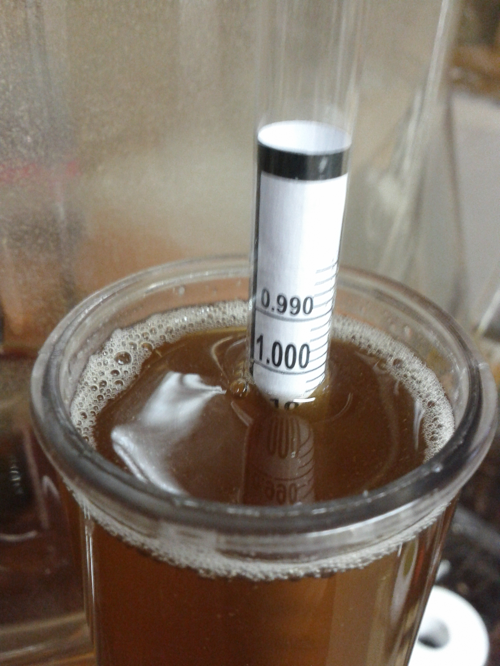 The hydrometer sample had some yeast in it, but as you can see in the photo of the glass (top of page), the beer is crystal-clear with a nice coppery-red colour. Gnarly Roots has a very complex aroma. There is a noticeable malt and alcohol character to the aroma, along with a wood-like character that came from the Brett. Behind these up-front aromas is a slight mustiness ad fruitiness that is also likely from the Brett. As is normal with strong, long-aged beers (especially those fermented with Brett), the fairly substantial aroma-hop additions have faded a great deal – a hint of Cascade sneaks through, but it is the malt and Brett that really shines through. As with the aroma, the flavour is complex and is closely tied with the mouthfeel of the beer. The first thing you note is the wine-like feeling of the beer – it is dry and light; not malty and heavy like most barley wines. The feeling in the mouth is one similar to a medium-bodied red wine; dry, hint of body, and a bit of drying of the mouth. This dryness emphasizes the beers strong bitterness. In fact, the bitterness is over-the-top, given the lack of balancing sweetness. There is not a strong Brett character as yet, but I suspect as this beer bottle-ages the Brett will continue to work, reducing the bitterness while imparting more Brett character. That said, some of the classic Brett flavours can be found in the back of the taste profile – a subtle earthy flavour & hints of woodiness. The taste ends off with two things – a lingering bitterness that is on the strong side (this should fade as the beer ages more) and a pleasant alcoholic burn on the back of the palate. While not as robust as most barleywines, there is no question you are drinking a high-alcohol beer. 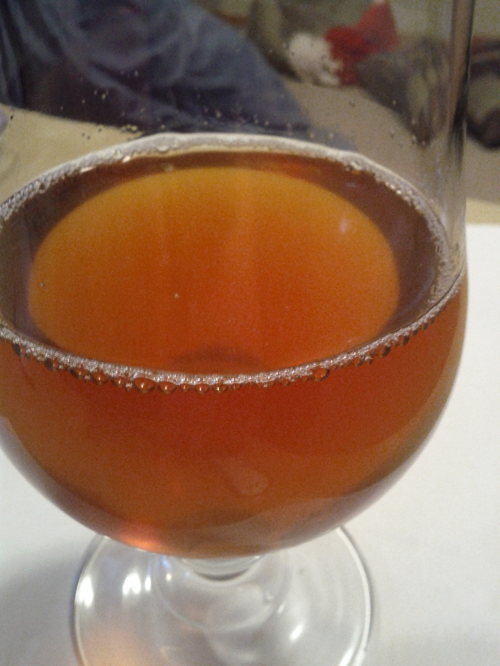 This beer is on the young side for a barley wine – and it shows. The flavours are not quite balanced yet, the Brett still needs to do a bit of work to provide some more earth-tones and to balance out the harsh tones in the beers bitterness. But as young as the beer is, it is already a pleasant, complex beer with many aromas and flavours to delight the palate. I suspect in three to four months it will be ready for regular consumption, and will continue to age and change for many years to come.